Copyright ©2013 PopEntertainment.com. All rights reserved. Posted: February 6, 2013. Based on the legendary Victor Hugo novel – by way of the operatic stage musical created around it – the recently released cinematic version of Les Misérables spans 17 years and is set against the political turmoil of post Napoleonic France, which culminates in the June Rebellion of 1832. Within this context, ex-convict Jean Valjean who was jailed for stealing a loaf of bread (played by Hugh Jackman) becomes mayor of a French town after illegally changing his identity in order to seek respectability. Hard-nosed police Inspector Javert (Russell Crowe) is in pursuit of the missing parolee who now owns a factory where the unfortunate Fantine (Anne Hathaway) gets expelled by an unscrupulous manager for having an illegitimate daughter, Cosette. Once he admits to his original identity to save a man falsely accused of his crime, Valjean agrees to take care of Cosette as her mother is dying. Therefore he becomes a fugitive again to avoid capture. Several year later, students Marius Pontmercy (Eddie Redmayne), Enjolras (Aaron Tveit), together with street kid Gavroche (Daniel Huttlestone) eventually foment revolution. 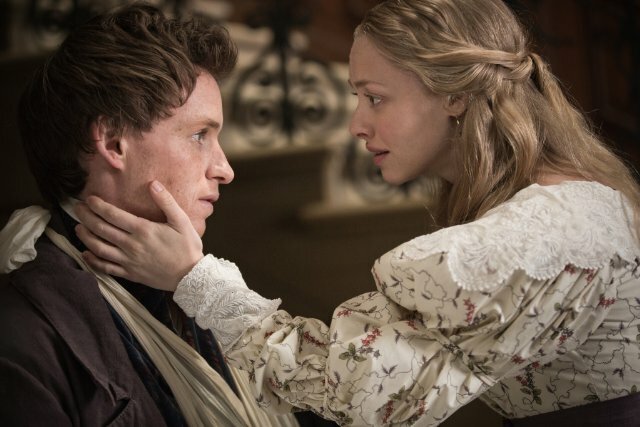 In the course of this Marius sees and ultimately connects with the grown Cosette (Amanda Seyfried), who he falls in love with. Meanwhile, Éponine (Broadway vet Samantha Barks, making her film debut), who knew Cosette when they were kids, realizes she will never have him so she also joins in the revolt. As this complicated story cyclonically whirls towards its romantic yet dramatic conclusion, they operatically act out the whole thing through song. Directed by Oscar winner Tom Hooper (The King’s Speech) and scripted by the auspicious team of William Nicholson, Alain Boublil, Claude-Michel Schönberg and Herbert Kretzmer, the film is packed with a star-studded ensemble cast who not only acts their way throughout a complicated plot but sings it as well. 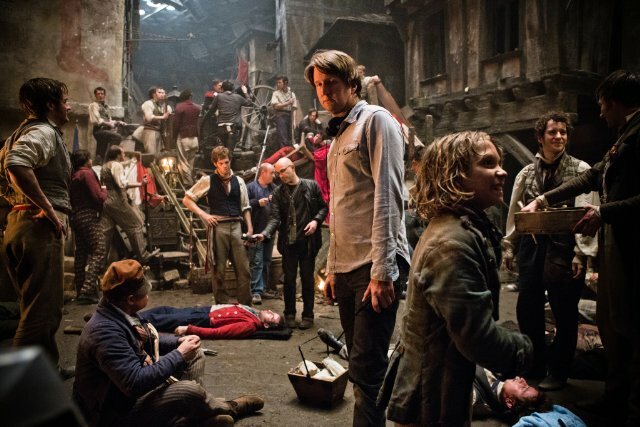 In order to promote it as an award contender, Universal put the cast of Les Misérables through their paces offering them for Q&As at every turn. One took place at a screening in late last year when director Tom Hooper was joined cast members Hathaway, Seyfried, Redmayne and Barks in a conversation about its construction and the trials of transferring a hit Broadway musical to film. Obviously such interactions have paid off with the film in contention for everything from Best Picture to Supporting Actress and Best Actor. How difficult was live singing? It’s tough as it is for a performer to sing and act, but how tough is it when you’ve got a single shot and you’re doing the entire song live? Anne Hathaway: Well, the live singing… I kind of thought Tom was crazy when he said it – crazy as a fox. That’s not the saying is it? This is going very well. There’s tremendous freedom in it, to really be able to get inside the words and express your character. It was great not to have to match your performance to something that you would have done three months before. Getting another day with the scene can reveal new things. What you would learn about a character in three months can be insane. Obviously, there was a lot of discipline; you had to protect your voice. I never knew if we were doing anything in one take or not. It was always the goal to get it in one but Tom didn’t come over and say, “Okay, this is going to be a simple shot. Now think about that while you sing.” He’s kinder than that. Eddie, Amanda and Samantha – what’s the hardest thing about singing and crying at the same time? Amanda Seyfried: It actually takes pressure off of you. 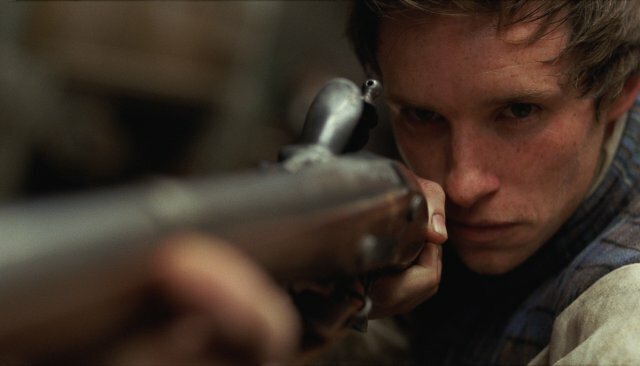 Eddie Redmayne: You can be out of tune. Amanda Seyfried: You can be out of tune and then it doesn’t matter as much. 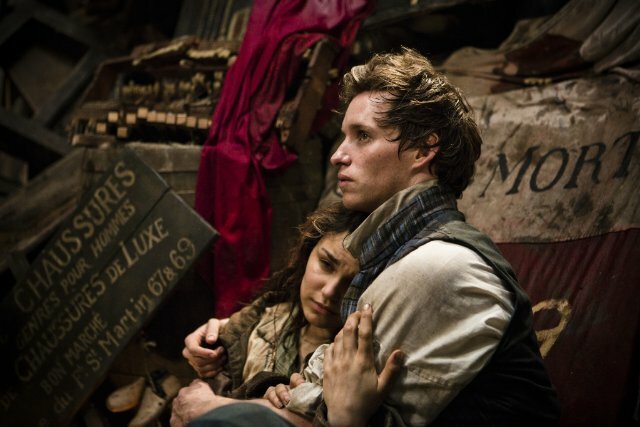 Eddie Redmayne: Sam is the one had it difficult because she had to sing, cry and [do it] in the rain. Samantha Barks: Yeah. When it’s really cold your teeth are chattering away. So, there’s a few things to contend with but it kind of all adds to it, I think. Tom, what went into having them all sing live? What were the potential pitfalls. Tom Hooper: Well, my instinct was to do it live from the beginning. As I was thinking about doing it, I was re-watching the classical musicals. I must admit, I struggle watching movies where people are lip-syncing to playback because there’s a slight distance between the actual performance and the lip synching or there’s a falsity in it. Ultimately, whenever it comes and particularly in the musical that’s comedic or light. You can relax into it. I felt that for something as emotional as Les Misérables I didn’t want any barrier between emotion and realism and truth. So for me, it was very important. I feel like acting is all about being in a pure language in the present tense. It’s very hard to be in a pure language in present tense if you’re copying something you did three months ago. What’s important in this is not just the fact that the singing is live, it’s that the accompaniment is being played live. We had two great on-set pianists, Roger and Jennifer. That allows the actor, if they need to take a tiny moment to have a thought or full emotion before they express it, it allows them to be somewhat controlled with the tempo of what they’re singing. I wanted to imagine an alternate reality, which is just as we generate sentence construction and grammatical construction. This is a superior set of beings who can generate melodic and rhyme construction off the top of their head. I wanted it to feel like these wonderful actors playing these characters were producing these songs out of the depths of their soul in the moment, to create that sense of being in the moment. For me, live is the only way of doing it. Eddie, you had never done a musical. Was that daunting not just to give a line reading but to give a line reading in a song? Eddie Redmayne: Yeah. It was. I’ve been a huge fan. The most amazing thing about this was that everyone involved was a fan, like a serious fan. We all felt that pressure as much as I’m sure a lot of people who love the musical felt it. What was interesting was having enjoyed the musical when I was a kid, I always wanted to play Gavroche. I spent my entire time on set just dying to play Gavroche. I just watched the film and I sat there jealous of Daniel [Huttlestone], who plays Gavroche. I loved it as a kid. Having worked in film, you realize that when we came to the auditions you had to… We ordered our own interpretations and showed them to the musical theater producers and composers [as to] what our take on it was. Sometimes it hits and sometimes it misses. We’d have moments of massive conversations about this, about what would work best. But this entire production was filled out of fear. Samantha, you’ve done the show onstage. How different an experience it was to be doing songs where you’re singing all the way through but there’s no pause at the end? Samantha Barks: It’s such a different world because when you’re onstage and you perform a number like “On My Own,” it’s an instant reaction you feel. You feel the buzz from the audience with the applause, whereas now you wait for months and months to see if people are enjoying it. It’s very different. This being my first film, it was so scary for me. I was used to the live singing and performing every night. But it was the film aspect that was new for me. So, there was something new for everyone, which made it very exciting really. Everyone was very supportive and lovely. What is the particular challenge of performing live like that when you’re singing? Amanda Seyfried: You just keep your voice in shape, which is all the time. You have to live like a singer, which can be very challenging. You have to be disciplined with how you treat your entire body, sleeping and not partying and eating the right foods and all this crazy stuff that a lot of actors don’t go through, which is fun. Yeah. It’s keeping up with the tempo as well. Actually, the funny thing is, we all had to wear earpieces. Everybody without an earpiece is obviously just hearing our voices a cappella, so when we forget our earpieces, we wouldn’t want to admit it. Because we would leave it somewhere and then you’d have to keep [your place], it would take a few minutes and it’s embarrassing. There were times when I forgot my earpiece and I would just try to go along with it and they would think I was crazy. Tom would be like, “What’s she doing?” The pianist is like, “What’s going on, she’s gone nuts,” because I’m out of tune. That’s the thing. All these weird things that you never think about. Anne Hathaway: You were trying not to waste time? How hard was it on the voice? How many takes did you do in a day? Tom Hooper: Hugh admitted that he did a one-man show in Broadway in order to prepare for that scene. I was kind of shocked that none of the other actors did a one-man show to be prepared, but Hugh did. So, Hugh is special [chuckles]. I must hand it to the cast, from the moment they all got the parts they started pretty full-on preparation regimens. The rehearsal group is nine weeks. All of them understood the importance of vocal fitness to be able to do it. It’s not only that you’re required to sing but you’re required to sing in the early morning, which is not normally the best time to sing in order for film sheets to work. But what was amazing was having done that training, we never had any problems amongst this group with vocal fitness. Anne, when you do “I Dreamed A Dream,” it’s not the song Susan Boyle sang. how many times did you have to sing it that day and how did you prepare to do it each time? Tom Hooper: Take four, take four was the one. Actually, one of the interesting things about embracing live tempo and live piano is it means that when she was doing “I Dreamed A Dream,” each take was a unique event. It’s quite hard to intercut different renditions of a song at different tempos. So, when I shot it, I had to shoot it from the point of view that each individual take was it. That’s actually quite unusual because normally you do a little from here, this bit from there, that one from there. Performances are often patchwork quilts of many different takes. Whereas, in each of these songs, all the songs you saw were did in one take all the way through. Was that something you discovered on the set or decided ahead of time? That song was all one shot. There are a number of the other songs that, with the only exception of a couple of cuts, were essentially the same shot. Were you shooting with more than one camera? Tom Hooper: I was exploring it, so I allowed myself the option of not filming it in one shot. In the edit room, it just became apparent there was something particularly powerful about the combination of live singing and letting the performance play out in one without intermediation of cuts. The challenge I felt I set with the cast was how to tell the story of these songs in a close-up. Because they all found the way to do that, the close-up held. If they hadn’t, then you would have had to cut away in order to find a that thing to go to. They were able to hold it and to me that is amazing. I think. Acting through song – what does it mean? Anne Hathaway: I have music as a tool to carry you. I think one of the reasons why Les Miz is so successful just as a piece is because all of the poetry, the hundreds and hundreds of pages of poetry in the book is interpreted with the melody. So, you can’t do a reading of the book in two-and-a-half hours, although it does fly by. So, you can trust the music and lean back into it. To sound thespian as well, it kind of is like when you’re doing Shakespeare, you just have to know that a lot of the work has been done for you through the music, through the verse and go with it. The key is just letting go. I think that’s the hardest thing about this is accepting that it’s an alternative reality no less viable than the one that we’re in. It’s just everybody’s singing. It was a really cool place to get to live for a while. It was very unusual. I don’t think any of us will have that again. The hardest part about it was when I had to go home and I couldn’t do it anymore. I had to go to a bridal shower, I was a mess. Tom Hooper: I have to credit the quality of the songs because we all found that the more you studied it, the more it actually resonated with many details of the book. Like all great works, it allows endless interpretation and it supports you in digging deep into it. I think all the actors found that. Was it done in real-time when you had Anne’s hair cut off? 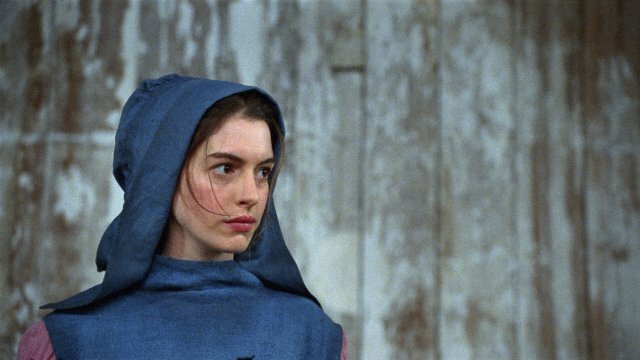 Anne Hathaway: It was a cold night in England. Tom Hooper: Initially, we started off with the actress playing the crone who cut her hair. She’s an amazing makeup and hair artist dressed up as the old crone. Amazing it didn’t distract Anne to have this man in drag cutting her hair. Anne Hathaway: It wasn’t the first time, sweetie. 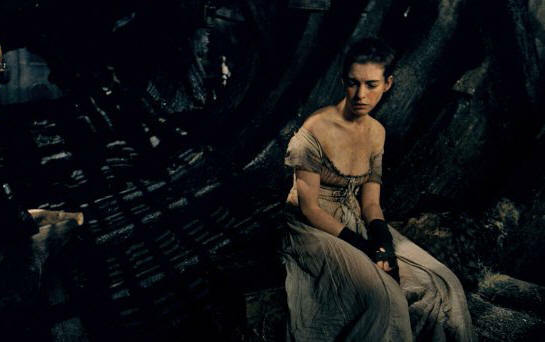 Tom Hooper: I wanted you to realize is that I had a slight different experience of shooting this because I watched before my eyes the most gorgeously crafted pixie cut appear. Anne was sort of acting the terrible trauma of a haircut. I was thinking this is just the creation of a lovely short haircut. I had to stop the cameras and you are to be doing a savage haircut. You have to make it look ugly. I sort of gave him a pep talk. Okay, we need to get the ugly haircut out of it. It was amazing. You looked like you weren’t enjoying it. Anne Hathaway: It was difficult. I put it up there with the most difficult things I’ve ever had to do, which I wasn’t expecting. I didn’t think I was that vain. I think it was hard because there was nothing that I could do for it like you do a stunt. You train the stunt, you sing a song, you train your voice. This was just letting it happen and accepting whatever the results were going to be and owning them for a while. It was very nice because we had the earpieces. I actually asked the sound guy to pipe a song through to kind of keep me calm with a song that I felt that even though it was written that way at that time. It was terrible because during that costume change there was a 15-minute break where I was balled up front. It was the worst moment ever. It was a very odd, glamorous mullet. Then it was done and it was done and I took a few beats and then looked into the mirror. I called my husband and was on the phone with him. I looked in the mirror and I said I look like my gay brother. I’m just Man Hathaway. Not since Chicago has there been a really great movie musical. In the end credits, you thank your parents for introducing you to musicals. To take this on after the success of The King’s Speech was a big risk. What made you think this was the movie to do? Tom Hooper: I have said thank you to Roger, who was my piano teacher when I was ten who [introduced] me [to] two musicals back to back, The Beggar's Opera and Patience, by Gilbert & Sullivan. It’s to him I owe not only my love of musicals, but through that I discovered drama and film and acting. Through that I also discovered I wasn’t good enough to be an actor. It was a very wise decision. But why did you decide to take such a big risk? Tom Hooper: The thing I found most rewarding about The King’s Speech was how it made people feel, particularly traveling with the film a lot and seeing it with audiences around the world. It was how it connected with people that I found was the thing I was most interested in exploring. When the idea of Les Misérables came along, I thought this is something famous for its emotional connection. It’s famous for its ability to allow people to re-experience strong emotions time and time again. You go to shows and hear someone chatting about that’s the 11th time we’ve gone. Why is that? It’s because the show allows them to re-experience these very strong, essential, primal emotions. I thought wouldn’t it be wonderful to see if there was an opportunity through the combination of singing and music and drama to create an alternate reality in the film space where emotions could be even more heightened? Where I could perhaps do something that was even more of an emotional journey for the audience than The King’s Speech. What’s fascinating is both emotional journeys are sent on the voice. With The King’s Speech it was the fragility of a voice in failure. With this it’s the flaring of a voice and it’s the most powerful. This is the closest thing to being in a live Broadway show on the big screen, even more than PBS capturing live shows on stage. It might lead people to access to musicals via film instead of actually going to the theater. Or, it could open up a whole other world to audiences that normally wouldn’t think that musical theater was for them. Did this weigh on you and your choices? Tom Hooper: It’s interesting. When you’re releasing a film around the world as we are in the next few weeks that you actually realize there are a lot of countries that have no tradition of going to musicals. Also you realize how much it’s an urban-centric experience. The New York audience has been one that has embraced Les Misérables from the beginning. The great thing about this film is that it allows that experience to be shared in places where it had no opportunity or access to see a live musical performance. In the first 30 minutes the unbridled hatred that there has never really been felt so strongly as in the film. It’s there somewhere in the script but it’s so intense on the screen. You don’t even recognize Hugh Jackman at first. He seemed so in character. It was wild. What made you go for the hatred so intensely? Tom Hooper: It’s all in the book. Victor Hugo talks about how 19 years of incredibly severe punishment for a minor crime of stealing bread leaves you with incredible pain and anger against the system. Victor Hugo is very clear that Jean Valjean actually was a good man but has actually become brutalized by that experience. He’s not necessarily a good man when he leaves. His anger blinds him to the righteous path. I felt it’s very hard for the epiphany, the power of his conversion to work if you don’t understand the extent to which he’s been brutalized. Because this man makes an extraordinary discovery of a way thinking in compassionate terms, in terms of the loving way to interact with people. He only gets that from his great grandparents. The order of the songs were played out differently from the play. How much did you have a say in that and how much did you mess around with it? Did the actors have any say in that? 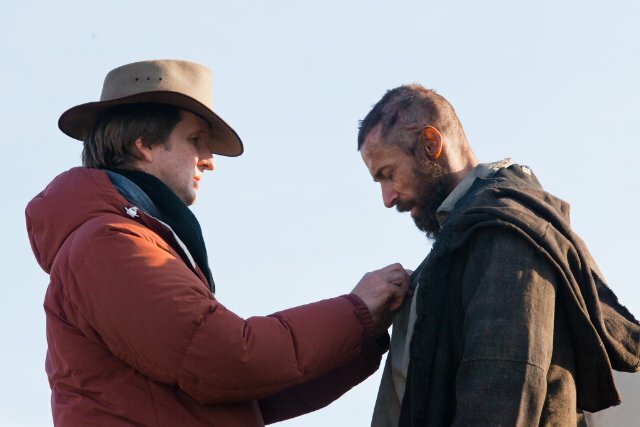 Tom Hooper: The great privilege of doing this film was that we were working hand-in-hand with the writer/producers. They were the original team who wrote and produced the show. When I would go to them with a suggestion like I need a song for Hugh Jackman to express what it’s like to discover love for a child in a parental role out of nowhere. It was all done with the original team embracing it. What sort of reaction do you expect from Les Miz purists? Tom Hooper: I hope the fans will see the DNA of the creators for a change. They’ve been actively involved and it’s been a wonderful collaboration. I think it’s quite rare for a movie musical to recreate the conditions of the original production. That’s what we did. Anne Hathaway: I also want to say something. The show’s been successful for so many years. We know that it works as a musical. It’s just a great experiment to see if it could work as a film. If it’s a bit different, there’s always the show if you like that version. There’s the 25th anniversary starring Miss Sam Barks who is just brilliant. There’s so many versions. It is a successful novel. I think the strength of the material that lets it work on so many levels in so many ways. This is just one interpretation of it. This film will be seen all over the world. Do you anticipate some resistance in some countries or in places for which this film might be too much, too political or revolutionary because of the tremendous passion generated by it. It’s hard to not root for the revolution. Isn’t that scary to some countries? Tom Hooper: That’s an interesting question, certainly one of the reasons I felt it was timely to make the film. There’s such extraordinary inequity in the world and such anger about it and so many protests that are really an abundance in the Occupy Wall Street movement. I think there’s a tremendously strong connection with the themes of this kind of anger against the machine. It’ll be interesting to see whether they’re in a country that don’t want to take it for that reason. When you’re in on the more groundbreaking for other countries is accepting the fact that they’re going to show the musical with the lyrics sung by the original actors in the original language. We decided early on to reject the idea of the whole thing dubbed in local languages because then you’d lose all these people’s performances. The whole concept of the live musical would collapse when it was entire dubbed in Spanish. The amazing thing is that Universal has embraced this and the singing will all be in the original language of whatever country it is, which is a great, great for the international market. There were very close shots bringing the emotions directly to the audience instantaneously. Did you want the characters to be close-up during their singing and towards the end for the camera to pan away to see the environment or the setting in which these emotions are playing on? Tom Hooper: If some shots did go wide with the physical space and physical space matters. With Anne’s song, everything she’s talking about is either in her head or in an imaginary other space. To cut wide during the song would not help or at least effect the meaning of the song. I think the choice about whether to extract actors from that context or put them back in that context is very much to do with teasing out the meaning of the song. What was the hardest thing you didn’t think you could do when first asked to make this film but ultimately did and felt better about it? Samantha Barks: I remember just being soaking wet for a whole day. That was quite a physical challenge because it’s like after a certain amount that was where your rib cage starts to shake. That was quite a challenge but it gets to a stage where I feel like it really adds to sitting and crying in the street. I don’t know. It felt quite painful physically. I’d say that. Eddie Redmayne: I remember the day that they built this huge, stunning street filled with shops, as Tom was saying. Everything was designed down to the last detail. These shops were filled with things. Tom had four camera men dressed up as peasants. We had 30 students and maybe 50 background artists playing peasants. He put ten minutes worth of stock in the camera and said build a barricade, action. What? There were pianos falling. It was the most terrifying ten minutes of my life. But at the same point, I felt like a seven-year-old having the best day ever. So, it was extraordinary. It was incredible. There were a couple of antiques. I don’t like to mention the antiques. Amanda Seyfried: It was pretty easy. I just sang in nice comfortable rooms. I had no dirty work to do. He was really nice. He told me to stop laughing once. What was the hardest thing Tom asked you to do in this? Anne Hathaway: I think Tom wishes that I’d given him a chance to ask me things. But I was like, “How about this, how about this, how about this…?” I was slightly eager. I think the hardest thing Tom asked me to do, which I did, was go home. I died and had to go home and leave the rest of the film to be shot. I was terribly sad to leave this project. I was terribly sad. I was so happy that I got to go back at the end. I thought I was going to shoot but we ended up just doing a photo shoot. But it was great to see how far everybody had come from rehearsals where we all began that first day and were all a little nervous to sing in front of each other to the end where we’re just in costume and everyone’s so deep in their characters and everyone had come so far. The hardest thing was having to leave all that. Tom Hooper: I thought a lot whether to embrace that decision: should [it] have been taken? But the first thing that I read was basically 50% music, 50% lyrics. For many sensible reasons, it followed the pattern of most movie musicals. I think there are only a couple of movie musicals that are through-sung. One is Tommy and the other Evita. But there was an understandable nervousness about embracing a through-song musical. In the end, why I did it is that I feel it’s very difficult if you keep alternating because we’re all chatting and suddenly I’ve got to sing a song. Why was the last bit a dialogue and then you had to sing that bit? [At the time,] I didn’t understand the connection. I went to see the composer and asked his advice. He said if you’re going to alternate constantly you have to work out the contract you’re going to make with the audience to allow you to do so. If you can’t find that, maybe you should consider it being through-sung. In the end, I felt like the best thing to do would be to create the atmosphere that people communicate through song and to not vary it; and not throw people back out of that world into a more normal world. But at the time, one of the biggest challenges was to reconnect to this. I’m pleased I did. CLICK HERE TO SEE WHAT ANNE HATHAWAY HAD TO SAY TO US IN 2009! CLICK HERE TO SEE WHAT ANNE HATHAWAY HAD TO SAY TO US IN 2011! CLICK HERE TO SEE WHAT ANNE HATHAWAY HAD TO SAY TO US IN 2015! #1 © 2012. Courtesy of Universal Pictures. All rights reserved. #2 © 2012. Courtesy of Universal Pictures. All rights reserved. #3 © 2012. Courtesy of Universal Pictures. All rights reserved. #4 © 2012. Courtesy of Universal Pictures. All rights reserved. #5 © 2012. Courtesy of Universal Pictures. All rights reserved. #6 © 2012. Courtesy of Universal Pictures. All rights reserved. #7 © 2012. Courtesy of Universal Pictures. All rights reserved. #8 © 2012. Courtesy of Universal Pictures. All rights reserved. #9 © 2012. Courtesy of Universal Pictures. All rights reserved.